Kenyans please cut CS Matiangi some slack – Mohammed Hersi . A hotelier who is passionate about Tourism & Governance in Africa. It is my pleasure to welcome you to my blog. Matters Airport Security & JKIA Incident with CS Matiangi. If I was to follow the queue etc there was no way on earth I would have made it . I spoke to an airport official who was kind enough to help me “jump ” the queue and this is allowed world over if you have proof that your flight is about to board. This is very normal world over. A well trained airport official with an even average intelligence would have no qualms with that. Early this year in March same thing happened in London, my flight from Nbi was running late and I had less than 45 minutes to connect for my Berlin flight. Again I spoke to an official and she was kind enough to fast track me to help me with my connection in Terminal 5 from Terminal 4. Those of you familiar with Heathrow it means taking a train. Now back to Matiangi case , he was running late with less than 30minutes to go . His handlers brought the matter to the attention of the security and the concerned supervisor was alerted but she chose to say NO. What would have been a non issue has now become a national debate. Kenyans please stop catching feelings, world over even in Kenya I have seen on very many occasions where people ( ordinary ) people allowed to jump a queue as long as you can show proof that your flight is boarding . I have happily given way to a passenger(s) in distress if my flight is hours to go because others have done the same for me elsewhere. 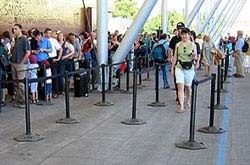 Now the other day in Mombass at 3am I decided to move the queue rope barrier and cut in since there was no one else . The security guy by KAA gave me a mouthful why I was messing up with his place of work. I could virtually see hate in his face . He was boiling, I was alone at that hour . I politely told him to calm down. The reason why there is a pin after every section is purely to allow exactly what I had done. This totally unreasonable guy wanted me to walk though the rope queue control even when there was no one else. What training do this guy go through ? From what I have just narrated at both Joburg and Heathrow such requests are made on daily basis if anything 24/7. Let me also tell you for free , we have overzealous officers and some who don’t fail to display their hate and they will claim they are putting you in your place Let’s face it , some of these officers like the one who confronted me in Mombasa deliberately chose to be difficult. I took time to educate him because he was totally ignorant . In Matiangis case the good CS NEVER declined to go through security. Kenyans please separate the two issues. All he asked was if he could be allowed to be fast tracked which is quite normal If you are running quite late. If I was allowed as an ordinary citizen of the world at two reputable International airports what about a CS who is all very well known to us. I now see Kenyans in our usual social media mob justice baying for CS Matiangi’s blood , some are even asking for him to resign. That demand is load of hogwash. The CS made a complaint which is within his right , it’s upon the management of KAA to handle the matter best way they deem fit. It is not the business of a complainant to dictate how a case should be handled. If an officer is not smart enough to use some degree of reasonableness then their entire role comes into question including that officer in Mombasa. Not all the officers at KAA are a problem. Being flexible does NOT mean you compromise on Security check. Please cut CS Matiangi some slack and my fellow Kenyans on social media relax. Next PostMadaraka Express ; In 2017 buying a train ticket you ask us to call ? Indeed we need to cut the CS some slack and whatever happened to giving honour to whom honour is due? Some of our officials need refresher training, some soft skills training and throw in some customer service in there. Officials need to remember they are in their positions to serve the people, this focus seems to have gotten lost a while back. How I pray that sanity, order, discipline, diligence, precision and good governance soon returns to our systems and structures. Thank you for the article Mr. Hersi, well put! My brother, while I hear you loud and clear and owing to the 2 situations that you have ably articulated I agree with you 100%. These things happen all the time. However, it is clear from the dismissed official that he expected preferential treatment because he was a Cabinet Minister and that is where the problem begins and ends. The rest are details. From your story,you always practiced courtesy to ask for favours,you are wrong to say that Matiangi did the same,all we have heard is that he arrogantly jumped the queue. Secondly should one lose her job because hersi was late,please you have a job let the poor single mother get her job back.Do not defend Matiangi who appeared late at the airport. Perhaps you need to go back to your English teacher and demand for a refund. Your grammar is pathetic, and distracts from what you have to say. Moha, it boils down by poor and lack of customer service training at many of our businesses. CS Matiangi should also come out as the leader he is and tell the nation his part of the story…and what could have been done differently. Also, what’s the teachable moment from that incident for us as a people and for KAA as a company? Finally, Kenyans, let’s move on to big and better things to build our nation. We have a lot of work needed from all of us.